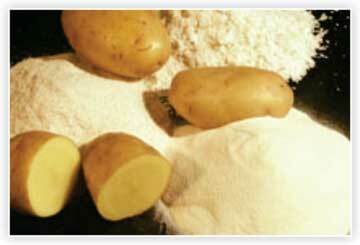 Potato starch is starch extracted from potatoes. The cells of the root tubers of the potato plant contain starch grains (leucoplasts). To extract the starch, the potatoes are crushed; the starch grains are released from the destroyed cells. The starch is then washed out and dried to powder. Potato starch contains typical large oval spherical granules; their size ranges between 5 and 100 m. Potato starch is a very refined starch, containing minimal protein or fat. A clear white colour neutral taste, good clarity, high binding strength, long texture and a minimal tendency to foaming or yellowing of the solution. Potato starch contains approximately 800 ppm phosphate bound to the starch; this increases the viscosity, gives the solution a slightly anionic character, a low gelatinisation temperature and high swelling power.